This weekly planner page goes on the right-hand side of your large cahier sized journal. It has one week per facing pages and is oriented vertically. The left-hand of this page is also available. 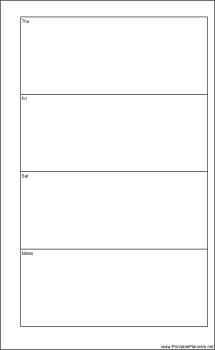 Each of the individual Planner pages is available to download for free, or you can download all of the pages for any size planner for only $9.00. The free version is available in Acrobat (PDF) format: just download one, open it in Acrobat (or another program that can display the PDF file format,) and print. The $9.00 version includes all of the Planner pages for a single planner size. You save time by grabbing all of the different page styles at once. You can pay using your PayPal account or credit card. You'll be able to download the entire collection within moments. If you don't see a planner page design or category that you want, please take a moment to let us know what you are looking for.